This is NOT all in your head. You can resolve this with the right help. Nothing, including your situation, is permanent. You will find it when you ask the right questions. You’ve searched and searched but you didn’t find an answer out there to give you a long term solution for your problem. Would you be open to a different solution that has proven to get real results? Your pain is trying to tell you something! Until you listen, it will continue to show up in increasingly more attention-getting ways. It will not stop until you get the message. Are you ready to be guided in how to listen and what to do about it? If you’re thinking, “I’m not in physical pain, I’m dealing with fill-in-the-blank!” Hang in there with me! It could be depression, anxiety, trauma, struggles with weight, digestion, yo-yo dieting, emotional eating, money pain, and the list goes on. If whatever you put in that blank causes you frustration, emotional pain, financial worry, ongoing stress, or just irritates the living daylights out of you, then you are in the right place. If you’re so tired of the condition you are currently in and are truly ready for a way out, then this is your next step to take… you have come to the right place!! If you haven’t heard my story, let it suffice to say for now that I was once curled in a ball on my closet floor, crying my eyes out, screaming “WHY ME?” and praying for a solution to the suffering that had plagued me for years. If you’re like I was when I was dealing with my challenges, you might be trying to FIGURE IT OUT AND THINK YOUR WAY OUT OF YOUR SITUATION. Maybe you spend your mental energy thinking about what specialist might have the solution, what treatment or diet or supplement might melt it away, what you’re eating wrong, saying wrong, doing wrong! The energy you spend on this never-ending search is most likely wearing you out and adding to the painful problem, not to mention the oftentimes financial cost. What if you discovered that all of this might be totally unnecessary? Would it be worth one day and less than the cost of a single doctor visit to see if there is an easier way out of your pain that will not only release you from your suffering, but also empower you to prevent new and different forms of pain and challenges in the future? The worst thing that will happen is that your mind will doubt this can work– just like I did! As a woman with a degree in psychology who stacked on certifications in clinical hypnotherapy, hypno-anesthesiology, and chemical dependency counseling, I was certain the realm of Western medicine had a solution. But I’ve never seen results with those forms of treatment that compare to the astonishing results, relief, and increased energy you’ll receive and experience in our Day Of Biofield Healing®! Your doubt, judgement, and skepticism are more than welcome here. As a matter of fact, I’d be suspicious if you didn’t bring them along for the ride. Things are about to shift. I’m here to help guide you. Be introduced to “must-have” tools designed to stop the vicious patterns that cause you unnecessary stress and dis-ease in your body, mind, emotions, and spirit. 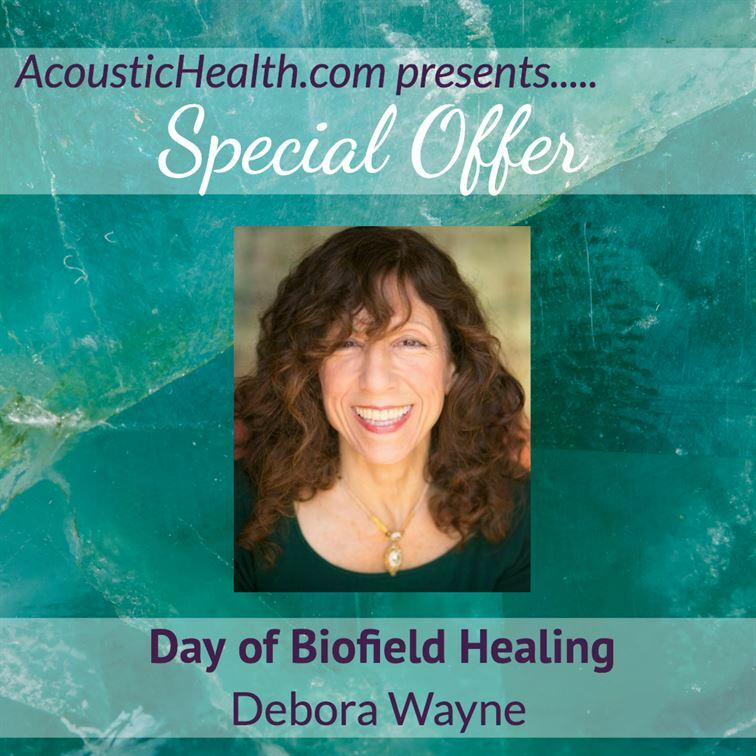 The Recorded Biofield Healing Immersion® sessions are just as powerful as the live sessions, and in fact, some people prefer the recordings over the live event! Evolve Now! Set: For those who are ready to delve even more deeply into their evolutionary work, these recordings contain more direct information for you to play with. Not only are they hugely comforting, they contain wisdom and knowledge that will further enhance your journey of transformation. First, THANK YOU! Thank you, Debora Wayne for the fact that I could just walk into my kitchen – with crutches – but I WALKED! I have an MS (multiple sclerosis) diagnosis and disability due to injuries from an assault. I listened to your recording, and WOW! Over the last few hours, pain is being released as years of trauma are freed and released. I have worked with doctors and therapists using CPT, DBT, EFT, EMDR, and PE to process and release trauma with little effect on my physical condition. As a PhD holding chemical physicist, I have known the pain is energetic in origin, but have not been able to address it alone. Today is one of those days that divides experience into everything that came before, and all that comes after. I will always remember 2/13/17 as my Freedom Day, Transformation Day, and Birth Day. The word gratitude doesn’t seem sufficient to describe what I am feeling. You have given me the opportunity to make the rest of my life the best of my life. I can literally feel decades of facades and crust of false beliefs and trauma melting away and a fresh lightness, a new light, bursting forth from within. It is a miracle in every way. I had a breakthrough on this morning’s call as well! This is an emotional wound I have worked to access for years. It cracked open. I am at a loss to describe the feeling. I am deeply, profoundly grateful. I can tell I am going to be a Pied Piper for Biofield Healing. I have studied meditation, Zen Buddhism, shamanism, and more. I have experienced extraordinary spiritual growth, but the physical pain has remained. Until now. I feel I have found the missing piece. “Before Debora’s program, I was unhappy with several parts of my body, and thinking about how and what to eat. I am more steadily attuned to how I feel and enjoy eating now. I lost weight without trying. I find I crave vegetables and fruits more.